For a film intent on subverting stereotypes, Zootopia slyly upends our expectations of animated animal entertainment, using its all-mammal metropolis to explore timely and thought provoking themes of racism and cultural prejudices, through a plot rich with mature and surprisingly resonant political allegories. Following hits like Big Hero 6 and Frozen, this is one of Disney’s best. Judy Hopps (Ginnifer Goodwin) is a bright and ambitious young bunny, who grew up in a humble family of small town carrot farmers, and dreams of being the first rabbit on Zootopia’s police force of all bigger animals. But her dreams are almost dashed when she immediately hits the proverbial glass ceiling, and is put on parking duty due to her small size. The animals in this world have evolved to the point where they no longer eat each other for food, and have found ways to all live in relative harmony. 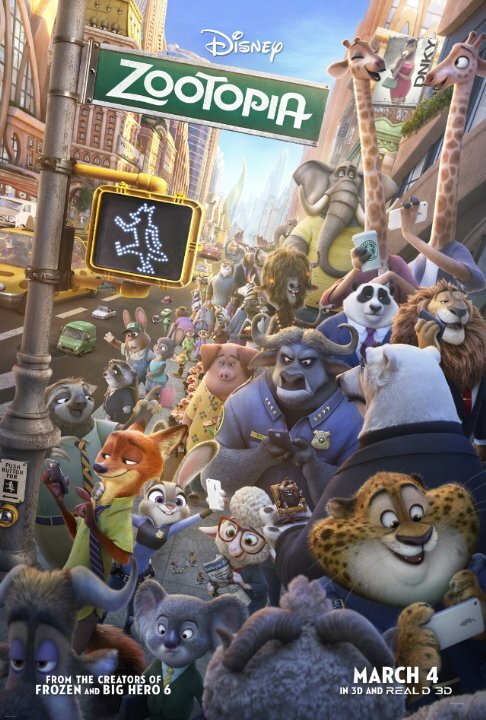 But when fourteen mammals are mysteriously reported missing, a rift starts to form between predator and prey, and Police Chief Bogo (Idris Elba), a tough cape buffalo, reluctantly allows Judy to take the case. She ends up having to work with Nick Wilde (Jason Bateman), a clever conman fox who makes a living hustling popsicles and pulling off other harmless swindles just to get ahead. As Judy and Nick become unlikely allies, the bunny has to overcome her childhood fear and preconceived ideas of foxes, and the fugitive fox has to learn to trust a police officer. The case takes them to different parts of the city, everywhere from a nudist resort to the mansion of notorious crime boss Mr. Big (Maurice LaMarche), as they discover that something much more sinister is afoot. They face real peril as they uncover a vast conspiracy, and tensions start to rise with only two days to solve the case. The film does a great job of world building, introducing us to such ingeniously designed places as Tundra Town, Sahara Square, Little Rodentia, and the Rainforest District, which are all within the city borders, but feature their own climates and sense of scale, depending on the species. This is a fully functioning world, connected by bullet trains and cable cars, and the animation that brings it all to life is some of the most gorgeous ever put on screen. As Zootopia sets up the rules and political systems of this world and introduces us to its diverse cast of characters, the film offers some great moments of humour throughout, including a few clever animal puns and delightful slow-talking sloths. Then Zootopia reveals its true hand, and it suddenly becomes something much more and even vitally important, shifting gears into sophisticated and profound territory that hits hard with almost eery real world relevance. The fictional city’s motto is “where anyone can be anything,” and this would be message enough for some films, but Zootopia takes it much deeper than that. The film offers a nuanced exploration of the realities behind this inspirational slogan, and the very real truth that even the most perfect and seemingly inclusive utopias can become deeply broken. It’s an incredibly powerful moment when we realize what Zootopia is really trying to say. It becomes an allegory of the systemic racism and deep-rooted prejudices that still exist in society and politics today, metaphorically tackling the fear felt in a post-9/11 world, and how it’s been abused. A main theme of the film is about going against stereotypes, and how some end up matching their stereotypes because they see no alternative to do otherwise. The film tackles real issues of profiling and sexism, and the choice to use animals to explore these themes adds universality to the messages of acceptance and inclusion. But these messages come organically from the characters, and the screenplay provides a gripping arc for them as well. There is a very moving emotional pull to Zootopia, centred around both Judy’s struggles to realize her seemingly impossible dreams, and Nick’s heartbreaking backstory, which offers compelling reason for his conman lifestyle. Ginnifer Goodwin and Jason Bateman deliver excellent and fully fleshed out voice work, helping bring these charming and instantly loveable characters to life. They are backed up by a sublime all-star cast, including Octavia Spencer as a worried otter, J.K. Simmons as the lion mayor, and Jenny Slate as his sheep assistant. The mystery-driven plot has echoes of Chinatown, The Big Lebowski and Inherent Vice, with some elaborate references to The Godfather added for good measure. These might sound like lofty comparisons for an animated film, but like I said, Zootopia isn’t your typical talking animal entertainment. The film works as a buddy comedy with writing more clever than many of its live action counterparts, and a neo-noir crime drama filled with surprising twists and turns. There isn’t a wasted moment in the 108 minute running time, with every single scene revealing clues and connecting into the overall arc of the film. Directors Byron Howard and Rich Moore have crafted a multilayered and richly rewarding piece of work, and like Pixar’s Inside Out, Zootopia is also a film that might just play better with adults than kids. This is a wildly entertaining and even genuinely suspenseful conspiracy thriller, loaded with multiple layers of deeply affecting social commentary to unpack. It’s Disney at their absolute best and most mature, a film that sells itself as entertainment, but also has something timely and vital to say that I haven’t stopped thinking about since seeing it. Zootopia is a work of staggering genius. In the animal-only world of Zootopia, Judy Hopps (Ginnifer Goodwin) dreams of becoming the first bunny cop in the big city. When her goal is finally realized, she faces an even bigger task – proving that she is more than just the token-bunny on the force. When a string of missing mammal cases hits the force, Judy is given 48 hours to prove her capability to the team. Noticing a few small details missed by the rest of the force, Judy teams up with a conman fox named Nick Wilde (Jason Bateman) who knows the underbelly of the city. Zootopia is a film that addresses prejudice – both those we see in others and the unknown prejudices we carry within ourselves. Even the main characters are not immune to having wrong judgments that they were raised to believe, either by species group or whether they were city or country raised. The distinction between predator and prey, and different species of animals become allusions to what could be seen as racial, gender, or any other dividing lines that cause us to judge each other by misplaced fear – and how easy it is for groups to use those fears for their own personal gain. Sometimes the biggest problems are caused by the genuine belief that we are doing is best to keep our own group safe. And sometimes all it takes is one leading by example and admitting they are wrong to start a cycle of change. What is brilliant is that Zootopia subtly allows the audience to make stereotyped assumptions about which characters are good or bad by the animals they are represented as. We see ourselves in these characters that judge by fear or become who others see them as just because it’s easier than trying to break free of judgements and be emotionally hurt in the process. The characters are well-rounded, very real and relatable, and it is easy to forget you are watching a story unfold with animated animals as characters. The film twists and turns, and is impeccably well-written. While I figured a few things out about the story a few scenes before the reveals, it didn’t matter – when the story took that exact turn, it was exactly the turn I wanted it to take and it left me smiling in the theatre. One of the best films of the year, Zootopia offers a story with a lot of layers, heart, and a whole ton of fun. I loved this film and I can’t wait to see it again. If you enjoy a clever detective/conspiracy story and can appreciate the incredibly detailed animated animal world the creative folks at Disney have dreamt up, then you’ll love Zootopia. Zootopia is a bustling metropolis where anthropomorphic predators and prey all live and work together in blissful harmony. Or do they? Young bunny Judy Hopps (Ginnifer Goodwin) decides to find out for herself. Not content to remain in Bunnyburrow with her carrot farmer parents (Bonnie Hunt and Don Lake), Judy sets out to become the first bunny cop in Zootopia. It’s all about following your dreams and believing in yourself, according to Judy. Life in Zootopia doesn’t exactly start out as Judy imagined. Police Chief Bogo (Idris Elba) takes one look at the relatively tiny officer and assigns her to parking duty. It’s on her daily rounds that officer Hopps crosses paths with a sly con artist fox, Nick Wilde (Jason Bateman). When her job is in jeopardy after a mishap in Rodentia, Judy is given one last chance to save her job and solve a difficult missing mammals case. As it turns out, Nick knows the darker side of Zootopia and is her best chance at figuring things out. The dynamic between the two, who at first glance are total opposites, is both funny and touching. There are so many funny moments in Zootopia thanks to the visual reality of so many differently sized animals living in the same city. This is an incredibly detailed, richly animated world with so many different amusing animal characters. One of my favourites is the mysterious Mr. Big (Maurice LaMarche) and his beloved daughter. Some of the biggest laughs in the film are courtesy of the sloths who work at the DMV. Anyone who has ever lined up for a drivers license renewal will relate. It’s not just the amusing animal characters that make Zootopia such an entertaining movie, for adults in particular. The mystery storyline with hints of corruption, discrimination, bullying and underlying prejudices is what makes Zootopia so appealing. This is a first rate detective story with some rather sophisticated allegorical lessons. Much of this will go over younger viewers heads, but anyone old enough to get it will have lots to chat about after the credits roll. With so many amusing and interesting visual details in Zootopia, this is a movie I’ll happily revisit on Blu-ray. It’s well worth seeing in theatres, though not worth paying extra for 3D. Canadian filmgoers will also want to watch for our very own news announcer Peter Mansbridge in his cameo as Peter Moosebridge. Enjoy the fun.